← A sweater or shorts? We Americans are funny about food. We love it. We plan social events around it. We tend to plan our daily schedule around it. And we love having choices. The more options, varieties and flavors the better. Lucky for us, in today’s world of mixed cultures, creativity and readily available ingredients, food is no longer just a boring form of sustenance. Now we can choose between grandma’s recipe for basic comfort food or something a bit more unusual and exciting. Thanks to restaurants on virtually every corner, we could eat a different meal every night for weeks without repeating one serving. Granted, having this love affair means that dieting has become a national pastime. According to Livestrong.com and the BostonMedicalCenter, it is estimated that approximately 45 million Americans diet each year and spend billions of dollars on weight-loss products. That’s a whole lot of people and a whole lot of time and money spent. As Real Women, we hope to land somewhere in between these extremes of diet and food excess. We strive to teach our kids healthy eating habits. We try to make decent choices for ourselves and our families. We try to keep things interesting, both to cook and to eat. When we gather friends and family together, food is always involved – often as the center piece. Food is social. Food is comforting. Food is fun. Those of us who enjoy cooking and baking are always looking for new menus and recipes and are fascinated by the myriad of cooking shows, publications, cookware stores and “celebrity chefs” that are available with tips and recommendations. I admit I fall into this category – my “fall back” tv channel when nothing else interesting is airing is the Food Network. I subscribe to a least 3 different food/recipe magazines. I am constantly trying new recipes. And for all of us bloggers, there seems to be a never-ending, glorious selection of food-related blogs to browse. I believe it is due to this fascination we all have that has led to what I’d call extreme-fooding – battles for the next outrageous food creation or combination. On cooking/celebrity chef shows, there are contests to come up with the next most amazing plate made from some pretty bizarre ingredients. Restaurants are quick to present the newest fad, or category of food for their brave customers to try. At grocery stores, special events and fairs we can enjoy samples of the newest food products. Speaking of Fairs – these seem to be the home of the most unusual, even ridiculous, food combinations possible. This week my son and I will be visiting The Big E – which is New England’s version of a State Fair. And along with all of the other remarkable attractions and things to see and do, we will experience the astonishment and wonder of bizarre foods. Some of the options include deep-fried lasagna, fried butter, chocolate-covered bacon, and the Fair’s signature piece, a cream puff the size of a child’s head. In the past year or two, the Fair announced the creation of The Big E Craz-E Burger – that’s it in the picture above. 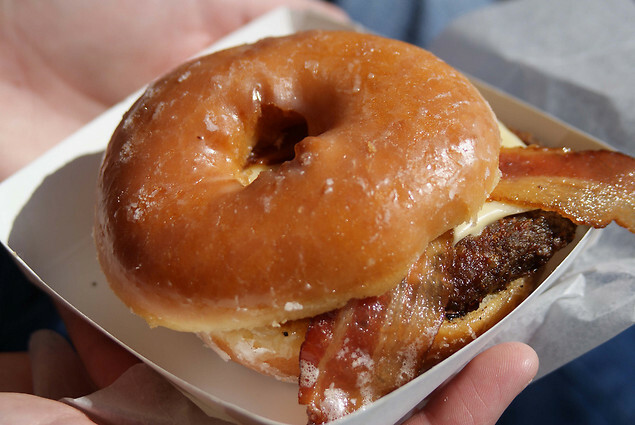 And yes, you are seeing it correctly, the burger buns have been replaced by glazed donuts. I stare at the signs for these foods in amazement, and I will admit, a touch of nausea. I wonder who is willing to eat some of these combinations, and whether they are concerned about having a resulting heart-attack. But then I realize hey, it is just us crazy Americans and our fascination with food. There could be far worse things to focus our energies on. So carry on, foodies. Be a little crazy, get creative, do your taste tests and have fun. Just don’t be offended if I draw the line at deep-fried kool aid. This entry was posted in Food and tagged cooking, eating habits, Fair food, food, foodies, restuarants, taste, variety. Bookmark the permalink. That’s a whole lotta Fritos. They do everything big in Texas! BTW, what is it with Corn Dogs? You never hear of anyone eating them in regular life, but they are everywhere at the Fair, and people are buying them. It is kind of like the Beef Stick company that shows up in Malls around the holidays. Where are they the rest of the year? Does anyone still eat that stuff?